Bring the taste and aroma of a fresh baked apple pie to your beverage service with this Bigelow cinnamon apple herb tea, and your customers won't be able to resist! It brings you perfect balance of warm, sweet and spicy flavors. Though this tea is naturally caffeine-free, it is made from an invigorating blend of apples, cinnamon, hibiscus, orange peel, rose hips, lemon peel, rose blossoms, and licorice root. When brewed, it develops an eye-catching candy apple red color and an aroma of sweet spices. Allow your guests to relax and unwind with a cup of this crisp and slightly tart cinnamon apple flavored tea that's great for any occasion! The sweetness of fresh apples paired with the captivating scent of cinnamon makes for a beverage that's hard to resist. Served hot or cold, this offering will create the feeling of orchards and autumn any time of year. So yummy! Our customers love this flavor tea and so do we! We will definitely reorder as we run out. Having a variety of flavors has been great for customer retention. Bigelow's Cinnamon Apple Herb Tea is a very popular flavor in the Fall time. We serve this tea with a cinnamon stick to provide guests with an extra cinnamon flavor. The Bigelow cinnamon apple herb tea is great and has a nice spice pallet to the flavor. The apple cinnamon smells great brewing and a great fall time tea. Smells just like grandma's home-baked apple pie. Nothing beats the scent of Fall and comfort food. This tea is equally amazing iced and refreshing when it's warm out. We are tea lovers at our business. If a regular customer comes in we always give them the opportunity to have some of our flavor of the day variety. This is a popular herbal tea. This Bigelow Cinnamon Apple Herbal Tea taste so great. It has this fruity apple taste with cinnamon flavor combination. It is caffeine free allows one to drink more cups. Great tasting. Highly recommended. The Bigelow Cinnamon Apple Herb Tea provides a delicate apple flavor and a more dominant cinnamon taste. The caffeine free composition makes this an overall great beverage. This is a good value in a classic tea. The price is good, the quality is high, and the flavor is just what you expect from a cinnamon apple flavored tea. 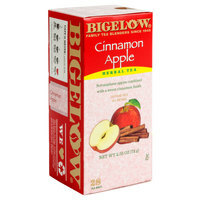 The Bigelow cinnamon apple herb tea is a nice tea with a great flavor. The spices in the tea are warm and soothing. A great tea for Thanksgiving day. I had never ordered this twenty-eight pack of Bigelow Cinnamon Apple Herb Tea before and have to admit I am so glad I took the chance because it is delicious. While I stuck to the hot version of this tea, my wife went with an iced version and was just as pleased. The aroma will freshen any room with fresh cut apples and cinnamon sticks and I definitely taste the strong combined flavor. I would highly recommend. Absolutely sinfully delicious. The cinnamon apple aroma is so fragrant, you can't help but think of being warm and toasty inside while it's cold outside. Great price on this product. This 28-bag box of Bigelow cinnamon apple herb tea is excellent. The combination is perfect that you can taste the apple goodness and exotic cinnamon taste. Great flavor especially for the fall weather. Just get some hot water and enjoy the crisp taste! Definitely a must have for the colder weather. The Bigelow innamon Apple Herb Tea has the perfect blend of Apple and Cinnamon. It is delicious and perfect for fall. I would highly recommend this for anyone. You can't go wrong. The perfect tea for the month of October. The cinnamon apple herb tea smells so delicious steeping and tastes just as good. One of my new favorites from Bigelow. Wonderful, sweet apple tea with a hint of cinnamon. This is a great, herbal tea with no caffeine. It is perfect for the fall weather and great by itself or with a sweet dessert. I highly recommend it. Great addition to our menu. Great flavor and our customers love it. Fall or summer this tea works for us. Very happy with purchase. Weill buy again. A superb tea that is great to serve during the fall months at your diner. The flavor is very good and the smell is wonderful. Our guests really look forward to getting this tea. I am glad to find this flavor tea. It is not available at retail stores near me. I like the fact that this is a boxed tea of 28 bags, more than what typical retail stores offer. Price is hard to beat, too. I love the flavor in this tea. Subtle apple flavor with the smokiness of the cinnamon is perfect on a cool winter night to warm your soul. I bought this for my husband who loves herbal tea. It quickly became one of my favorites as well! You can taste the spicy cinnamon but a pleasant apple taste as well. Definitely recommend! I love this herbal tea! This is the cinnamon apple and it's caffeine free. This has the right amount of cinnabar in the mix. The tea tastes very fresh. Nice combination of different flavors all mix in one. Only from Bigelow! Give it a try. We got t from here, where you can find good selection at a great price! Didn't enjoy this bigelow tea as much as the other bigelow teas I ordered. Reminds me too much of cinnamon applesauce, which some people might enjoy. CINNAMON! By far the best cinnamon apple tea we've had. The cinnamon doesn't take a passenger seat in this tea, it's the driver. Apple teas are very popular and this should be on the top of your list. A nice flavor on a cool fall night. While this is not the cheapest tea, the price is still really low for this premium tea. This Bigelow tea is Fantastic. Yet another tasty Bigelow brand flavored tea product. It tastes like cinnamon and apple and is not short on the flavor. This one tastes good but great with added caramel flavoring. The aroma of this tea is intoxicating. It smells of fall and comfort. The taste is warm and has a sweetness that is not overwhelming. This is a great caffeine free option for customers. Great flavor, with more emphasis on the cinnamon. Was very popular in our office during the winter. I'd recommend using two bags if brewing in a bigger cup as this tea isn't that good weak. I love all Bigelow teas. Especially the cinnamon apple tea. I've been using them for years and will definitely recommend it. I will definitely order more when I need it. Very nice tea. The cinnamon apple herb tea is best in colder weather. Its flavor is rich and doesn't require any additional sugar. I recommend. Bigelow teas are mostly satisfying. This one has a strong cinnamon and apply taste. The color is very satisfying too. When I want to drink caffeine free drink that is citrusy, I am definitely drink this one. Has a nice scent and deep color. The taste is mediocre but overall not bad. Nice packaging. Good to have in your tea bar assortments. I thought this tea was good and different from the usual black and green tea variety. After a few cups it starts tasting more and more like fruit punch which is weird considering the flavor combo. I love all of the Bigelow tea flavors! The Apple and Cinnamon one is great for fall. I also steep it with the apple and cranberry tea as well. This is a great flavor of tea! Unique cinnamon apple herb flavor! Sure to become a top selling tea at any restaurant! Great with dessert!! This has become a top seller. We added this flavor after we had been up and running for a while. The sells immediately surpassed the others. Highly recommended. What can be better than a nice hot cup of Cinnamon Apple Tea on cool autumn day? I have been enjoying this product for years and I will continue to do so. I highly recommend you get some. This is the most popular flavor of hot tea that we serve at our store. People LOVE this flavor. Definitely a good buy for the price. We purchased this to give as a sample to our customers. They loved it so much, we are now carrying this tea as a regular on our menu. It has a nice, bold spice and is a staple for any tea selection. This tea is a favorite with our congregation. We serve coffee and tea to 1700 each Sunday and go through the flavored tea very quickly. This one is one that everyone seems to enjoy.